There’s been something of a lower class uprising in the Premier League over the last 9-12 months. Leicester were left for dead last season yet here they are lurking around first place despite most analysts saying they shouldn’t be there and won’t stay there (in fairness, they shouldn’t but that’s already been discussed). Bournemouth have remarkably remained a positive shot differential team this season despite a litany of injuries to their attacking core (with expected goal numbers not painting Bournemouth quite as highly, locations have hurt them), and have Crystal Palace somehow found a formula of making the shots that hit the target incredibly valuable? (Well, no they haven’t but the divergence between TSR/ xG formulas that count all shots versus SoTR/xG models that count only SoT is fascinating). Nestled in with this rising class is Watford. The club with the same owners as Udinese have been a pleasant surprise this season. This was hard to see coming as they gained automatic promotion last season with numbers that at least on the peripheral level weren’t really impressive. Their TSR was barely above par at .512, their SoTR of .555 was better but again didn’t suggest that they should’ve finished in the automatic promotion spots. All things being equal though, The Championship is as advertised: a wacky land of misfits trying to gain promotion and there’s evidence to suggest that basic shot metrics don’t translate well repeatability wise compared to the rigidness of the PL. Over the summer, Watford, laden with some Premier League cash opened their check books and spent on the likes of Etienne Capoue and Jose Holebas. Bookies widely predicted them as one of the teams that were likely to go down this year and it made a decent amount of sense, although despite widespread spending being compared to QPR seemed like a couple bridges too far. Here’s the thing, Watford have actually been good this year. Okay that’s not entirely true. They’ve been good at one end of the field this season and it’s their defense. Simply put, through 20 games Watford’s defense has held up quite well. They rank in the top 9 in shots conceded, top 7 in shots on target conceded and depending on the xG model at hand, they rank them somewhere in the upper mid table..
I’m actually quite surprised at how good Watford are defensively. Signing a player like Capoue does help in strengthening your defense but you would think that a team that wasn’t particularly great in terms of shot suppression in the Championship would struggle to find greater success in a considerably higher level league, but here Watford are to buck that. Using Paul Riley’s xG numbers, Watford are on pace to have an xG against of 43.6, which going back to 2010-11 would be the best defensive output of a promoted club. The only club I could find that were within 5 goals of that mark was Crystal Palace in 2013-14, and it took a midseason hire of football’s favorite manager Tony Pulis to accomplish that. What’s helped Watford defensively this year is they’ve spent a vast amount of time in a +1 game state. No club in the PL has spent more time up by one goal than Watford and if you want to just simplify it to just being in a winning position, Watford still rank fourth in that area, 170 minutes above the league average. Being in a winning position often means you can have a save% higher than normal, which Joel Salamon talked about that with United a month ago. That being said, it’s not even that Watford are doing similar things like United are in terms of pushing teams back as far away from their final third area as possible. Watford are just below the league average in both final third and neutral zone passes conceded. And when it comes to SV%, Watford’s are only ~1-2% above the league average whether tied or up by a goal, unlike United who literally form a wall once they’re in a +1 game state. You add all these things together, and it gives an overall picture of a slightly above average defense that should be able to hang on for another 18 games. No ridiculous save% in any situation and decent shot quality suppression. An added bonus for Watford is that their defense has done well versus big clubs. They limited Tottenham to 10 shots despite being down to 10 men, Manchester City got 16 shots against them but the quality of those chances weren’t anything to write home about, and Chelsea was more of the same. Riley’s numbers have Watford pretty much dead on with their 22 goals conceded at 22.94, and there really isn’t too much negative to write about Watford defensively except that their goalie Heurelho Gomes is prone to the hilarious gaff every once in a while. Transitioning up the pitch to their attack and it’s a mixed picture. Let’s start with the positives: It’s fun to see a good ole English 4-4-2 up and about, particularly when the two up front complement each other so well. Troy Deeney and Odion Ighalo scored loads of goals last year in the Championship with a combined tally of 41, 38 of them of the non penalty goal variety for a per 90 combined rate of 0.64. Ighalo in particular had an absurd scoring run, with a NPG per 90 rate of 0.93. Some of that has changed with Deeney only being limited to six goals this season and his conversion rate plummeting into the low teens. But one thing that hasn’t changed is Ighalo still scoring goals at a ludicrous rate. His NPG per 90 this season is at 0.75, a mark that’s very comparable to the likes of Romelu Lukaku (0.77) and Sergio Aguero (0.81). Ighalo’s xG per 90 mark of 0.55 and an overall conversion rate of 20.6% suggests that there’s some overperformance in his season, but it isn’t uncommon to see strikers have seasons where they overperform xG data by 4-6 goals. Ighalo at full flight is a joy to watch, with his performance versus Liverpool a perfect example. He was built to play in a high tempo league, and he’s thrived this season in a way that even scouts who liked him couldn’t even have imagined. The problem with Watford is once you get past those two, it’s just grizzly when it comes to offensive production (and that’s probably being nice). Deeney and Ighalo have scored 20 of Watford’s 25 goals. That isn’t a misprint. That is staggering and when you look at the squad they’ve assembled this season, you can see why that’s the case. It’s filled with a bunch of late prime age journeyman that you would be hard pressed to know anything about. Contrast that with Leicester, another team that primarily plays a 4-4-2, and they have 5-6 guys who at the very least pose some type of goal/playmaking threat. Assuming Watford stay up, and it’s almost impossible for them not to, this will be an area they need to heavily invest in. There are some other things to worry about with Watford in attack. Their on target conversion rate overall is 33.3%, third highest in the PL behind Leicester and Everton. Also a quirky trait about Watford is their ability to score at a ridiculous rate when they’re either tied or down a goal. It’s funny, they’re ~13% below the league average in scoring goals when winning but 13% above average in scoring when the game is tied. 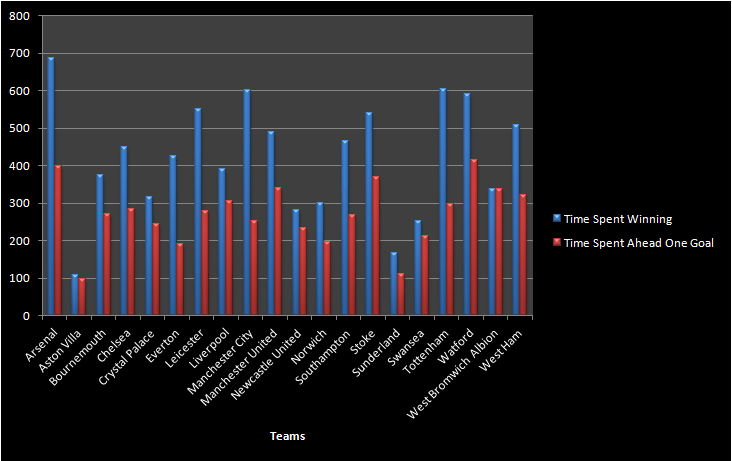 No team has a higher conversion rate when the game is tied and only Everton have a higher rate when down in a game. If and when those numbers even up, you’ll probably see Watford come down a peg or two in their goal scoring which may make for an unpleasant scene. Having said all of that, Watford have more or less been as good as their current league standings. Yes an overall PDO of 104.8 does scream a little bit of regression, yes their talent level whether using xG or SoT suggests that Watford have gained 2-3 more points than they should but that’s nothing extraordinary and end of season projections have them finishing in around 9th place. They have an above average defense and a striker who’s been on top form since the start of last season. 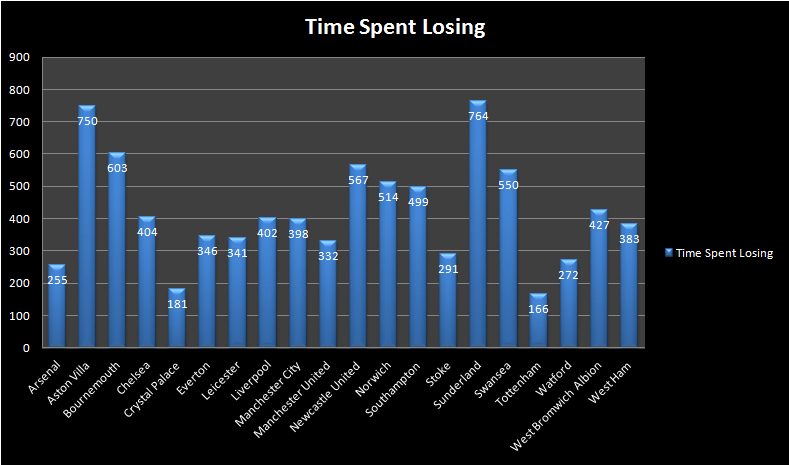 For a first season in the PL, it’s almost the quintessential type of year to have. There are obvious problems that need to be addressed and the failed loan acquisition of Juan Iturbe suggests that Watford weren’t blind to their attacking woes. In many ways, their season is the opposite to QPR’s from last year and this despite a transfer model that looked so very similar, which is one of the nicer compliments one could give to 2015-16 Watford.